Spring is just around the corner, which means that nearly 47 million children around the country will be participating in a wide range of contact and individual sports, such as soccer, track, lacrosse, swimming, softball, baseball, and golf. Spring sports also mean an increase in sports-related injuries. Following are five facts about sports injuries that every parent of a young athlete should know. 1. Approximately 33 percent of children participating in team sports will suffer an injury serious enough to miss a practice or a game. Even injuries that appear to be minor at first glance should be evaluated by a qualified sports injury doctor as soon as possible. If you visit the emergency room or a specialized sports injury clinic, you will likely encounter long wait times for treatment or an appointment. FastMed Urgent Care has specialized sports injury doctors available at select clinics, and all of our doctors provide immediate care for acute and chronic sports-related injuries. No appointment is necessary, and we see most patients within an hour. 2. Sports injuries are not limited to group or contact sports. 3. Girls are up to eight times more likely to experience an ACL tear than boys. Popular sports among female athletes, including basketball, cheerleading, and soccer, place a significant strain on the anterior cruciate ligament, also known as the ACL. Although it is not clear why ACL tears are so much more common among girls, various theories suggest that it may be due to anatomical and biomechanical differences between males and females. Just like a traditional sports medicine clinic, FastMed Urgent Care clinics have state-of-the-art digital X-rays and other diagnostic equipment necessary to diagnose and treat torn ACLs and other common sports injuries. 4. Approximately 62 percent of sports injuries occur during practices rather than games. A FastMed sports injury doctor can also refer your child to an appropriate sports rehabilitation therapist if necessary. 5. Many sports-related injuries are preventable. Schedule a pre-participation sports physical at one of our FastMed locations before the start of the season. Make sure that your child’s coach has your emergency contact information and is aware of any special medical conditions your child may have. Encourage your child to warm up and stretch before every practice and game. Encourage your child to take frequent water breaks to avoid dehydration. Make sure that your child has all of the necessary safety gear for their sport and that all equipment is in good condition. Stress to your child that it is important to speak up if they are in pain. Pain is a warning that damage is occurring to the body. Pushing through the pain will only exacerbate any potential injury. Make sure that your child has at least one day off per week from sports to give the body time to recover. Make sure that you and your child are aware of the signs of a concussion. Symptoms of a concussion include loss of consciousness, memory problems, confusion, headaches, blurred or double vision, dizziness, and drowsiness. If you suspect that your child has a concussion, do not allow them to participate in sports until they have been cleared by a doctor. 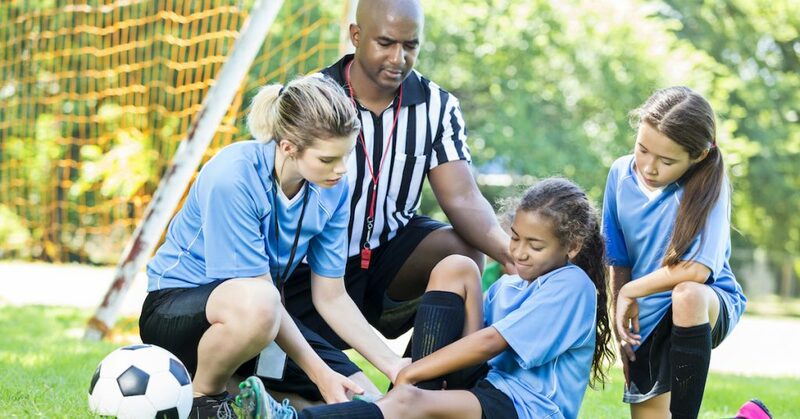 We hope that your child remains healthy and safe this spring sports season; however, our dedicated team of providers is standing by to help if an injury should occur. We offer friendly service in a clean and welcoming clinic environment at a fraction of the cost of an emergency room visit. Contact us today for more about our sports medicine services.